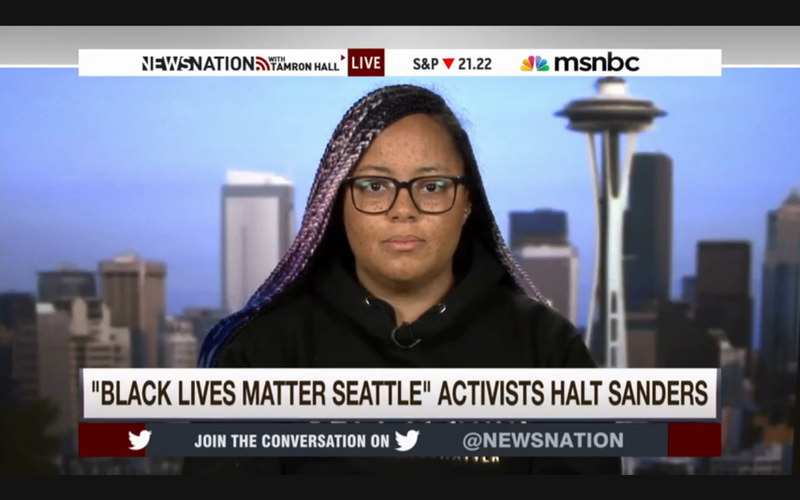 Co-founder of the Black Lives Matter Seattle chapter Marissa Johnson spoke with MSNBC's Tamron Hall about the group's action in taking to the stage during a Bernie Sanders rally Saturday. Johnson called all of the rumors about her not being a part of the Black Lives Matter movement and a Sarah Palin supporter "derailment." "I think it's really interesting to note that no one is really engaging with the content that I said on stage," she said. Johnson also stated that the reason they stormed the stage was Bernie Sanders' inaction in developing and presenting a concrete platform for criminal justice reform in the time since he was confronted by protesters at the Netroots Nation conference. "Bernie Sanders has had the opportunity [to put forth a criminal justice reform package] and has not," she said. The same day Johnson and her cohort took to the stage the Sanders campaign announced the hiring of Symone Sanders as his national press secretary. She is a young black woman affiliated with the Black Lives Matter movement and has helped the senator draft a comprehensive criminal justice reform package. Watch the full interview below, and also take a look at Johnson on This Week in Blackness where she speaks further on the protest and movement.